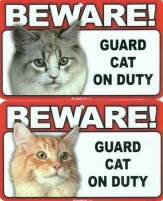 If you know of a "guard cat", this sign is an important addition to any home. 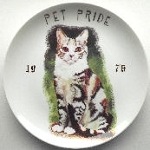 Made of medium weight, high gloss plastic, the sign is 8" wide x 4 3/4" high. Hole at the top for mounting. Select your favorite style.